We often get asked about the origin of and the meaning behind the symbols drawn on our working oils. The short answer is that they’re our versions of specific geomantic figures that are resonant with the nature and planetary force of each oil. Geomancy was a method of divination widely practiced through the Renaissance in both Europe and the Middle East and originating in the interpretation of markings in dirt or the pattern of cast pebbles. It was refined over time and became a sophisticated method of practical prediction thought to communicate with the world soul. The practice of geomancy was later resurrected by the Hermetic Order of the Golden Dawn, but remains underutilized in modern magic. I first encountered the art of geomancy and the sixteen geomantic figures reading Paul Huson’s Mastering Witchcraft (where he refers to them as witch runes) as a young witchling, and then again later in reading Agrippa (there’s a section in Pseudo-Agrippa’s Fourth Book of Occult Philosophy dealing with the practice of geomancy). I find it a highly useful method of divination, and I’ll probably blog more about my work with it and how it fits into our practice in the coming weeks. The geomantic figures are sixteen figures formed by dots– 4 lines of either one or two dots stacked on top of one another. For divination, you come up with figures using some method of generating random numbers (e.g. random scratches in the dirt, coin flips, the number of chirps in a cricket’s song, the number of pebbles snatched from a stream, etc.) and these figures are combined, arranged and interpreted. These figures have specific meanings, areas of influence, combinations of elemental forces, and associated planets, zodiac signs, and symbols. Thus, much like the runes, they could be said to be specific magical forces that can be used for practical spellwork in addition to divination. This is how they’re used with regard to our working oils. 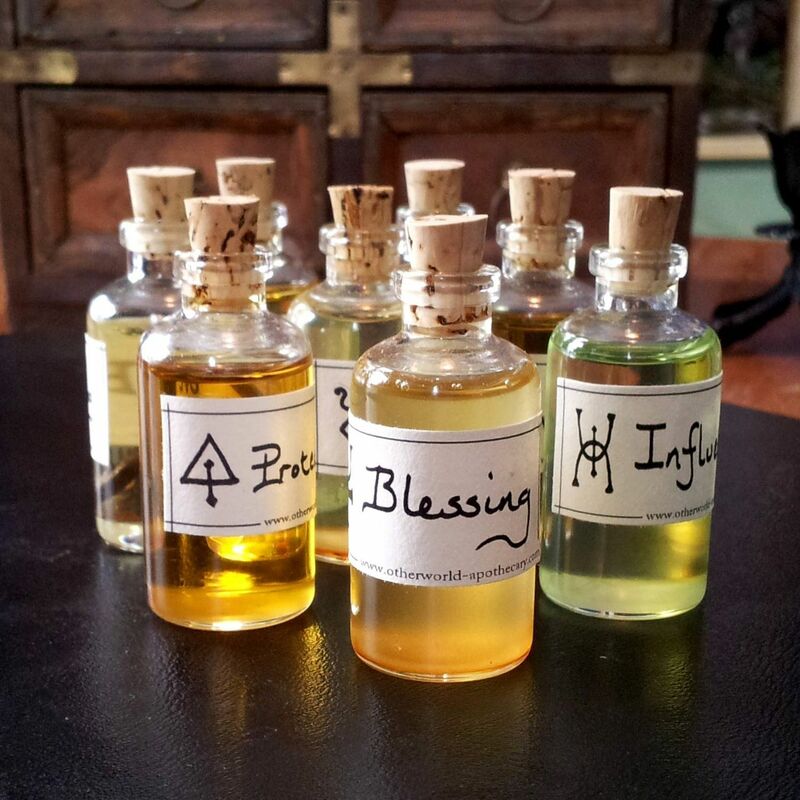 In the above product photo you can clearly see our sigil on the bottle of The Oil of Influence; this is our version of the figure conjunctio. Conjunctio’s nature is that of the crossroads, the meeting of different forces which interface and work together and is ruled by the planet Mercury, the quicksilver conjurer. 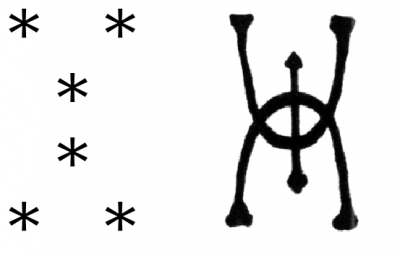 Below, you can see the “dot form” of conjunctio on the left, and our sigil for influence on the right. When developing sigilized forms of the geomantic figures, you should retain the underlying double points and single points, but these can be embellished with diamonds, triangles, dots, crosses or open circles, and connected with straight lines or arcs as you see fit. The end result here is an interlocking symbol, bringing together the target of the spell with the magician doing the work. The symbol sort of looks like two tongues, appropriate for work that involves exerting control over people and institutions through communication. Additionally, the center of the figure shows a fixed eye. In many forms of folk magic, including Appalachian practice, “the influence”–a force of compelling fascination, is put on people through the fixed gaze of the witch. In Frances Barrett’s The Magus, you can find alternative forms of the more familiar patterns composed of dots. Studying these forms carefully will give you some idea of how the dots are connected to form these sigils and from this knowledge you can develop your own versions of the geomantic figures like we did. Here are another couple of examples of the layered meanings behind our versions of the figures. The geomantic figure for Love Oil is that of puella. It’s classical meaning it that of love and beauty and femininity and the figure is associated with the handmirror of Venus. In addition to these meanings, our sigil incorporateds the form of a vessel or chalice, bringing to mind the ace of cups in the tarot. This could be the spell of the “loving cup” with the love philtre pouring in, or a representation of the blade conjoining the cup as in the great rite. It’s also a fairly vulvic symbol, appropriate for an oil ruled by Venus, the mistress of love, beauty and pleasure. For Blasting Oil, the geomantic figure used is cauda draconis, associated with the volatility of fire, disaster and calamity, and combines the forces of the malifics Saturn and Mars. The cross pieces on our sigil are reminiscent of an old alchemical symbol for poison. In addition, the sigil is a clear representation of a forked stave, invoking the poisonous tongue of the Serpent of Old and the forked blackthorn blasting rod.